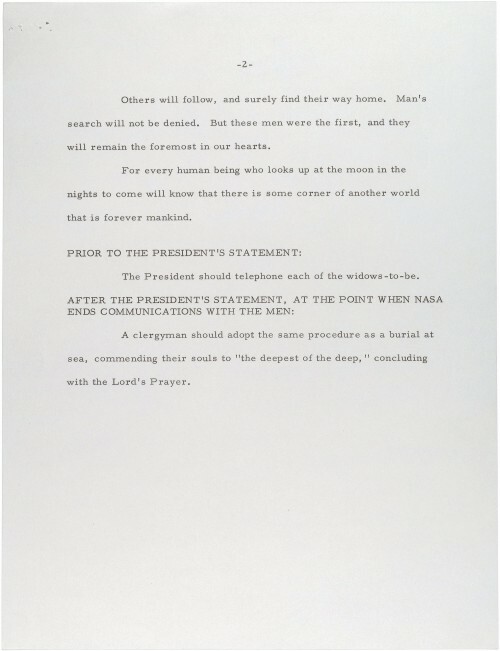 For any space nut, the most famous speech from the Apollo era was never given. It was prepared for Richard Nixon and is called In event of Moon Disaster. This was to be given if Apollo 11 had failed. It’s a powerful speech. A very moving one, tinged with tragedy but it is also uplifting. A challenge to continue the quests of exploration. Another bump on that bumpy road of exploration. It would have, sadly, bookended the whole Apollo program. 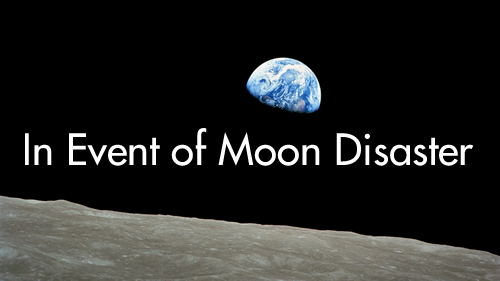 From the loss of the Apollo 1 crew to the loss of Armstrong and Aldrin on Apollo 11. It is also quite strange as it is only about if they had been stuck on the moon and Michael Collins lived. Possibly the person who would have been alone for another three days whilst getting back to Earth. 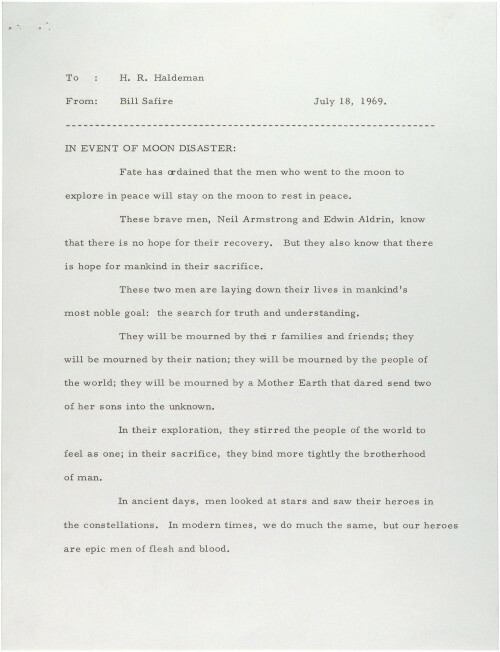 The words were written on July 18, 1969 by presidential speech writer Bill Safire. It starts as you would expect. The facts that, probably, the assent engine had failed. This had quite a high probability of failure as the only time the engine could have been turned on was on the moon. It couldn’t survive a test firing due to the fuels used. The last paragraph of this speech is possibly one of the most powerful pieces in any speech. Paraphrasing Rupert Brooke’s First World War poem The Soldier. Instead of a corner of a foreign field, it is now a corner of another world. Finally, it shows what the procedure would be when NASA finally stops communicating with The Eagle. It would have been interesting to see who would have been the last voice the men heard. From the records, if the assent engine had failed it would, probably, have been Glynn Lunney. If it was he would have broken protocol and talked to the men directly and not via who was CAPCOM at the time. A clergymen should adopt the same procedure as a burial at sea, commending their souls to “the deepest of the deep”, concluding with the Lord’s Prayer. Fortunately, this speech was never given and was hidden away in the Presidential archive for many years. Reading it in its entirety it does show that it would have made a powerful statement from a President who wasn’t know for this sort of thing. Click on either of the images above to see a bigger version.